So, about 4 years ago I was crazed, or maybe just partly crazy. I was doing college visits with my daughter at UCLA and other Southern California colleges. We rented a white dodge charger and we drove around in the LA sun with the windows down and music blasting on the radio as we went from college to college. I felt alive and happy. It’s not what I expected, I thought we would go to Los Angeles, be overwhelmed, and then cross that off our list and move on to other colleges. But, I fell in love. I fell in love with everything there; the sun, the beautiful people with their beautiful smiles, the beaches, and I didn’t even mind sitting in traffic as we navigated the many highways. I came back home and fell into a depression. I had recently been demoted from being a manager back to a staff job at work and my new boss was demanding and cold. I tried to make the best of it, but my pride was deeply wounded. I was making more money but my heart was hurt as I had poured everything into being a manager and it wasn’t good enough, or so I felt. 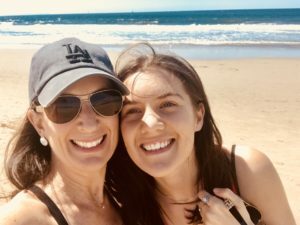 My daughter was in high school and moving away from needing me so much, my marriage was in transition from being parents to deciding what we were going to do when our daughter went off to college. I felt out of control of the direction of my life. I decided I needed help in sorting things out, so I made an appointment with a life coach. In our first couple of conversations I felt like a scattered, crazy person as it was over the phone and I only had 20 minutes to tell her about all my feelings. I tried to tell her that this isn’t how I thought my life would be, that I have always tried to do the right thing and be a good friend, wife , mother, employee so why weren’t things working out? I told her I had been looking into apartments and jobs in Southern California as I started to think moving there would make me feel better. I told her about my conversations with my husband and how one day I wanted to separate, and the next day I wanted to work on being close and doing things together. I didn’t know what I wanted. I just knew I wasn’t happy. I was confused, my brain was in overdrive trying to make sense of what was going on in my life as it wasn’t going according to plan. My coach was very patient with me over the months and years that followed, she would send me reading suggestions, and email me questions and quotes to think about. It helped a lot, and it helped to have an outside person reflect my words and thoughts back to me, and give me some harsh reality when I needed it. I trudged forward. Every day I would make little adjustments to make my world make more sense. It seemed I was moving at a snails pace, and I would get frustrated and angry that I wasn’t feeling better sooner and I would fall back into bad habits and old patterns. I went through a period of going to a bar by myself and having a glass of wine and pretending I was waiting for someone and just looking through my phone. When I think back on this I almost want to laugh, what was I doing? I was searching, just searching. I started to do yoga in the mornings and deep breathing, and this made a huge difference. Just 20 minutes of this in the morning helped me to start to become centered. I stopped drinking cold turkey one day, I had just had enough and realized that the alcohol was not helping me. I started to become more in touch with my emotions and how I felt in different situations and in certain relationships. I made the hard decision with the help of my coach to cut off communication with my older sister as she would send me spiraling backwards when I talked to her. I love her and I don’t blame her but there is just too much past family dysfunction that would come up when I talked to her, and it would always put me in a bad, very lonely place that would take me weeks to recover from. I moved my desk at work so that I was in a quieter spot with a friendly co worker next to me. We became really good friends and she helped me immensely in my struggles. I can honestly say her pure “niceness” literally changed my life. I felt like she saw all my efforts when no one else did, and she helped me see myself. Things were changing for the better, a little bit each day. I felt like I was walking in 4 feet of mud in a never ending race, but I kept going. I downloaded the “meetup” app on my phone and joined some groups and put myself out there. Some groups I didn’t connect with, but one group I did connect with and they are 3 of the most amazing women I have met in a long time. Honest, real, and encouraging women. They helped me to claim a room in my house, and take back my space to do things just for me. I felt myself coming back to life again, I felt my spirit being woken up. I felt motivated to buy a computer and start writing again. My own computer that was just mine, not the family computer. Then I started a blog and Instagram account, and through this I have connected with so many like minded women that are going through the same thing that I am, and they encourage me to keep going. 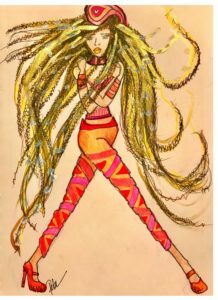 Even my close friends are finding out things they didn’t know about me, for instance that I am an artist also, and I have always liked to draw fashion pictures of women. I forgot that too. I forgot. I forgot about me altogether. I moved forward in my life, and I forgot about me. No wonder I was crazed, crazy, and searching. I was waiting for someone to tell me I was worth coming along for the ride in life, but I needed to tell myself I was worth it first. As I start to see my own worth, I feel more grounded. I feel like I am getting my compass back, I feel myself day by day feeling more alive. What I have realized in this journey so far is that it is ok to put myself first, it is ok to follow my heart, it is ok to say no to some things that just don’t make sense to me and not explain myself. And I also learned that not participating in my own life was like putting an immense amount of effort to throw an amazing party and then not sending myself an invitation. Now I try and tell myself every day that I am invited, that I matter, that the party just won’t be the same if I don’t show up. When my only daughter left for the Air Force and gave 20 years to the military, I quite simply lost my mind and an enormous piece of my heart. All of these years later, I find myself mostly still not fitting in, in my own life. I have joined a small group of local women, only two meetings under my belt, however, am having more faith in myself and looking forward.